"In March, The Wall Street Journal said Ken Kutaragi was a "stumbling block" for Sony; now they're reporting that the controversial chairman and group CEO for Sony Computer Entertainment, Inc. -- and father of the PlayStation brand -- will be retiring his post effective June 19. Of course, the 57-year-old exec was recently kicked upstairs, removing him from day-to-day operations following what many considered to be a botched strategy for the PlayStation 3. Kaz Hirai, who replaced Ken in December, will be promoted to CEO of SCE." It looks like Sony is not going to let one man ruin their entire game division. I am surprised that this action was taken so soon because the PS3 has only been on the market for 6 months. The damage is done it seems and the Wii may already have too much hype, word of mouth and pure momentum for Sony to catch up. The tide has turned. Wow this is huge news. I wonder who will replace him. Also- AMAZING picture for the article. I laughed out loud when I saw it. Isn't that a great pic? LOL, the guys at NeoGaf are pros at this kind of stuff. 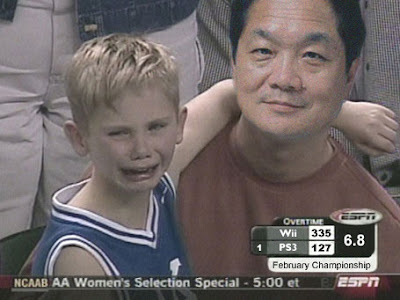 I got the picture from them when the NPD sales were posted for Feburary with the Wii selling over 300,000 for the month. Insert new score and Sony President and presto!